EtherRain™ is an intelligent Ethernet sprinkler valve controller that was designed to work with an external scheduler like HomeSeer through an Ethernet network. EtherRain requires only a single command from HomeSeer to run a complete 8 zone (or more) cycle. The EtherRain Plug-In for HomeSeer was designed for use on HomeSeer 3 including HomeSeer Zee controllers. This plug-in provides the interface for managing and configuring your EtherRain controller(s) in HomeSeer. Setup and configuration is easy and multiple EtherRain controllers are supported. Irrigation is scheduled using conventional HomeSeer events. Why Choose EtherRain for HomeSeer Irrigation? EtherRain is the optimal irrigation controller for HomeSeer. It offers easy setup and it uses HomeSeer events for complete irrigation scheduling through HomeSeer. 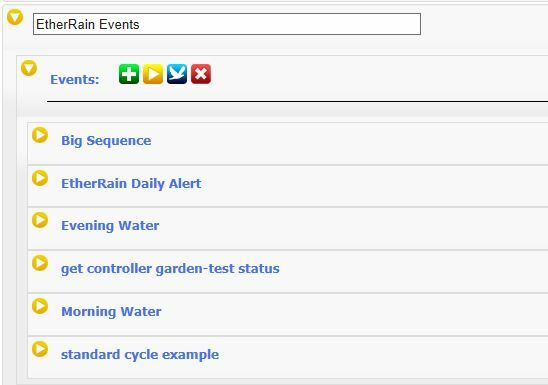 It is very easy to set up irrigation cycles using EtherRain because it only takes one event to run a complete cycle. This holds true even if you have multiple EtherRains and you want to run them in sequence (up to 64 zones). EtherRain provides reliable irrigation. Only one command is sent to EtherRain for each 8-zone cycle. The zone timing is included in the command allowing EtherRain to completely manage zone timing. (No OFF commands are required.) In addtion, EtherRain is maintenance free - no battery and no calendar within the controller - HomeSeer keeps the starting time clock. The EtherRain plug-in helps you save water automatically by providing a monthly setback feature that lets you easily scale water usage by month. Other irrigation alternatives for HomeSeer can be more difficult to setup and manage, and can be less reliable because they can require explicit on and off commands for each zone. In addition, some are based on RS-232 which is limited in length and offers little surge protection. Some other irrigation plug-ins only offer a status interface to otherwise stand-alone irrigation schedulers, and these controllers have to be programmed outside of HomeSeer thus introducing unnecessary complications and maintenance. The EtherRain plug-in allows you to easily manage and control all of the EtherRain controllers on your network. The plug-in works a little differently than other HomeSeer plug-ins in that it does not create a HomeSeer Device for every EtherRain. Instead it lets you define a virtual EtherRain device for each of the controllers that you want to use with HomeSeer. Once the virtual controllers are defined you can send commands to them via button clicks or via events. The screen shots below show the simplicity. Once installed, the EtherRain Plugin page is access from HomeSeer's "Plug-Ins" Tab. Click the "ER Main Page" flyout to access all of the functionality of the EtherRain plug-in. All of these are accessible from the plug-in main page. This is what the main EtherRain page looks like. At the top of the page you'll find the global control. This lets you disable, enable, temporarily suspend and resume all controllers. Click the "Add Controller" button, and you'll see this page. Just fill in the fields to define a controller. Make sure the controller name and password matches the name and password of your physical EtherRain. You don't have to worry about IP addresses. From the main page, click the "Cycle Builder" button. You'll be able to define cycles by entering a cycle name and run times for each zone. You'll be able to specify the cycle name when you set up your HomeSeer irrigation events. If you want to apply the optional setback profile, check the box in the first column of the cycle row. A great feature of the EtherRain plug-in is that it lets you set up cycles that can automatically trim back watering based on the month of the year. When you define your cycles, the zone run times that you enter will represent 100% values. On the monthly setback profile you can automatically scale back irrigation for months that are cooler, like spring and fall, and turn irrigation off in winter. You can set an email alert in the case of errors, or a log alert. Define a HomeSeer Event group for Irrigation. The easiest way to set up an irrigation event for a single controller is to use the "RunNamedCycle" function. If you have multiple controlers you can set up a single event that will run the controllers sequentially just like a 16, 24 or 32 zone controller would. HomeSeer is a Registered Trademark (R) of HomeSeer Technologies, LLC. wunderground.com, and WunderMap are Registered Trademarks (R) of Weather Underground Inc.